According to the World Health Organization, stress is the health epidemic of the 21st century and is responsible for many forms of chronic illnesses. In the 1980s, Japan recognized the physiological and psychological dangers of stress and depression and sought out a new, affordable and effective way to combat it. This was the beginning of “Shinrin-yoku”, roughly translated as ‘taking in the forest atmosphere’ or ‘forest immersion’. Across the last three decades this led to the development of the Public health approach of Forest Therapy. Forest Therapy is a research-based medical practice of guided immersion in forests with the aim of promoting mental and physical health whilst relaxing and enjoying the forest. Now recognized and widely practiced as a Public health initiative, Forest Therapy is gaining acknowledgement globally as evidence-based, cost-effective and natural medicine. Rapid urbanization in the many parts of the world is leading to high levels of stress, depression and obesity. Asia, for example, has some of the highest population numbers, increasing levels of pollution, long commuting and work hours and lack of green spaces. People have, therefore, been seeking ways of balancing the stress of life and illnesses due to unhealthy lifestyles. The International Nature and Forest Therapy Alliance (INFTA) is committed to establish Forest Therapy as scientifically-proven natural medicine by building networks and establishing partnerships with research, education and Public health bodies across the globe. Through these networks, INFTA will access studies, contribute to research on and create awareness about Forest Therapy and Forest Medicine. INFTA’s mission is to make Forest Therapy accessible to all for the health and well-being of people world-wide. 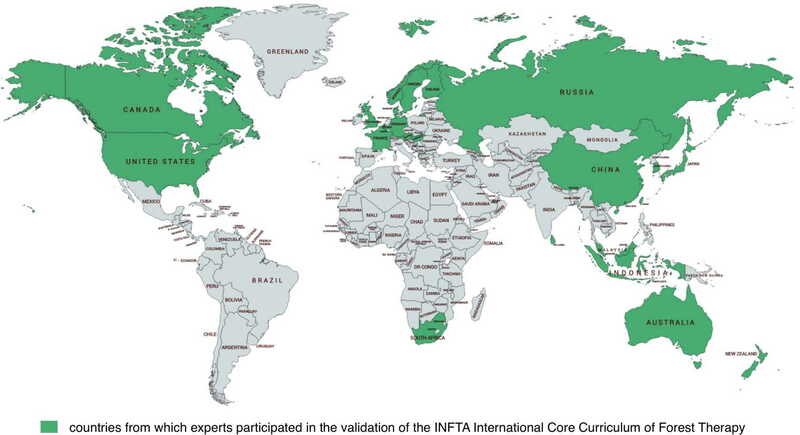 As the key player in formulating the International Core Curriculum on Forest Therapy (ICCFT) as part of an international network and collaboration, INFTA certifies and accredits training providers and Forest Therapy guides. According to industry projections, there will be a huge demand for INFTA-Certified Forest Therapy Guides world-wide in the coming years. Recent estimates by INFTA project, for example, a demand of some 250 INFTA-Certified Forest Therapy Guides in Australia and up to 10,000 INFTA-Certified Forest Therapy Guides in China over the next five years.